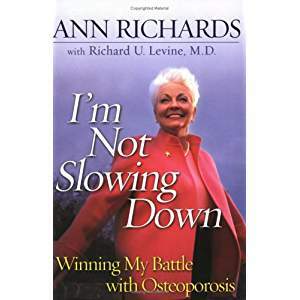 In the book I'm Not Slowing Down: Winning My Battle with Osteoporosis, Texas Governor Ann Richards details her struggle against the incapacitating disease and outlines preventative measures so that women can begin the second act of their lives with strength, agility and confidence. In 1996, after falling and fracturing her hand, Richards went for a bone density test. She was diagnosed with osteopenia, an early stage of osteoporosis. After witnessing both of her grandmothers and her mother fall victim to the disease, Richards was determined to overcome its weakening effects. She began a doctor-approved prescription of medication and exercise, plus she radically modified her lifestyle. Known for her straight talk, Richards teams up with Richard U. Levine, M.D., clinical professor of Obstetrics and Gynecology at the College of Physicians and Surgeons of Columbia University to fill the book with information and advice on the subject. Identify the factors that may increase vulnerability to osteoporosis including menopause, a lack of estrogen, and use of drugs like caffeine, tobacco and alcohol. Emphasizing the importance of the bone density test and explaining the process step-by-step using Richard's own test as an example. Providing a comprehensive list of calcium-enriched foods are beneficial, plus foods to avoid. Sharing everyday tips to improve muscles and prevent bone injuries. In the mission to help women conquer osteoporosis, Richards has developed a useful, and often humorous book that will inspire many. Right after I was elected governor of Texas, we were in turmoil trying to put things together, hire staff, move into the capitol office, and move from my house to the Governor's Mansion. In the midst of all this, we got a notice that the Queen of England was coming to Austin. It is a real undertaking to entertain the queen. We had to go to entertain the queen school to learn how to act around her. Secret Service flew in from Washington to tell us where we could and could not go and what we could and could not do. On the day she was to arrive, I was in my office at the capitol when I got the call saying the queen was at the airport. I went tearing down the stairs and running across the rotunda to meet her on the capital steps and my mother's voice went through my head as clear as as a bell saying, Where do you think you are going, to see the Queen of England? And I thought, Yes, Mama, I am! "Let me tell you what I've learned"